The Dismantling Table is a ventilated work station adapted for dismantling flat panels, either as a stand-alone unit, or in combination with an FPP60 Flat Panel Processor. 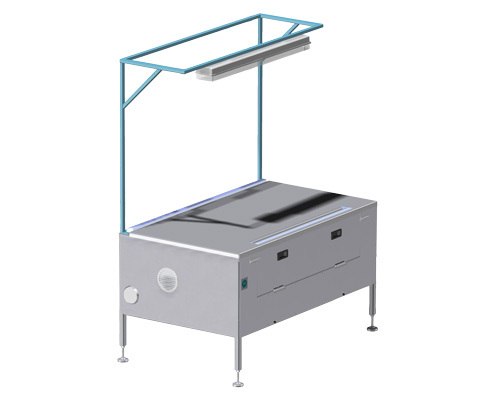 The DMT is designed with open sides for the operator to easily be able to rotate a screen at the work surface, and for safe dismantling of fluorescent lamps in LCD screens. The dismantling station has an integrated lighting fixture, and is equipped with a built in ventilation system which features a carbon filter for mercury absorption, and a collecting drum for fluorescent lamps. The process air is going through the featured activated carbon filters to ensure a safe working environment.